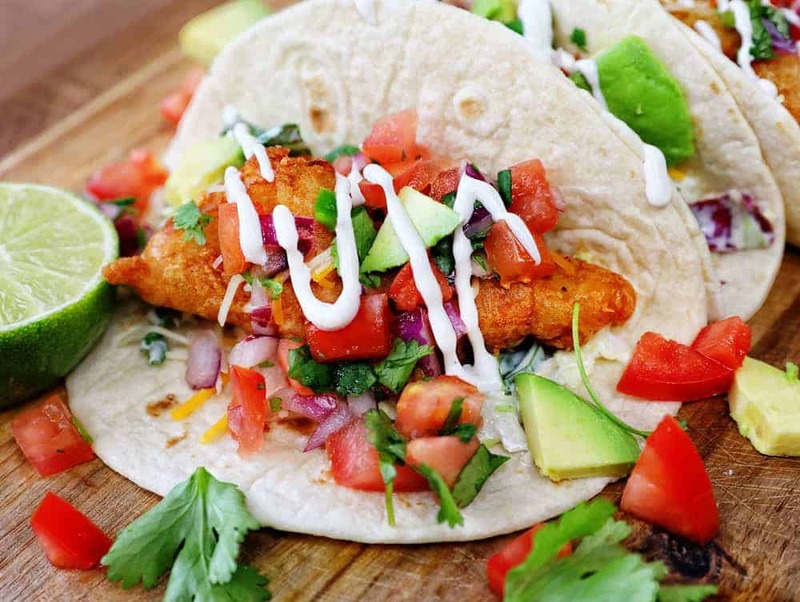 This Baja fish taco recipe will win over even the harshest fish critics. Crispy beer battered cod filets, topped with fresh salsa, and a zesty white sauce, all wrapped in a flour tortilla for the ultimate taco night! 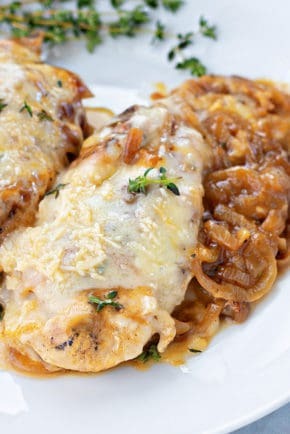 You should also check out our Bacon and Cream Cheese Stuffed Chicken Breast for another weeknight dinner win! Fish tacos are my favorite kind of tacos. That is not to say that I don’t like chicken or beef or shrimp tacos, but if I get to pick, its always fish, every time. 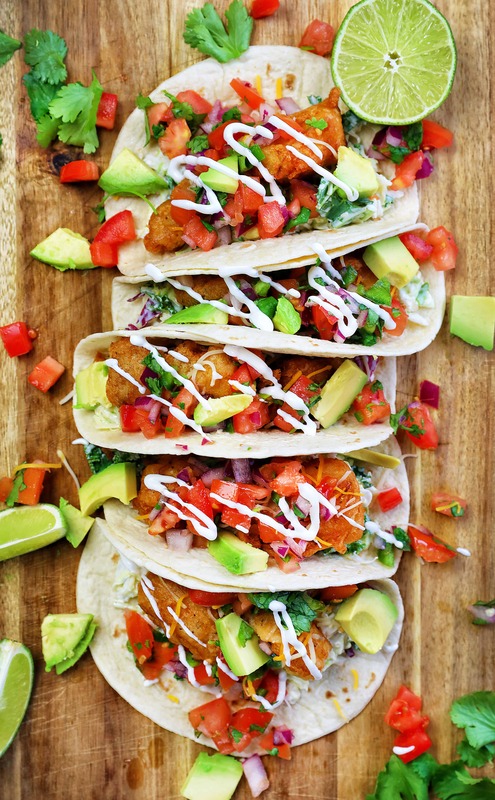 This fish taco recipe is packed with so much flavor. Everything from the tender white fish, to the zesty taco slaw and the fresh salsa packed with fresh tomatoes, cilantro, avocado, red onion, jalapeno, and lime will have you running back for seconds. 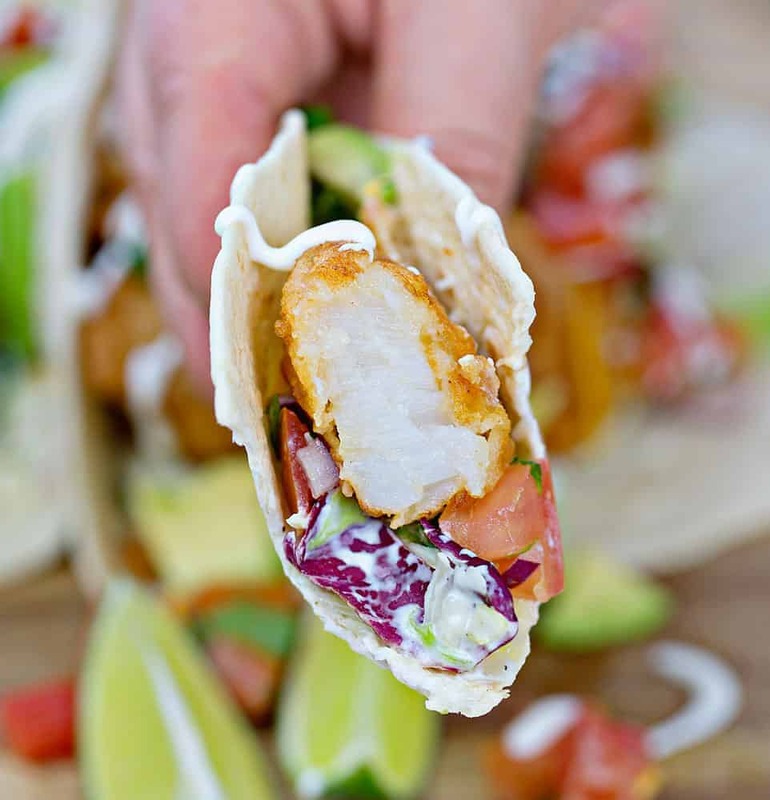 We chose to use Cod fillets in this fish taco recipe, but you could substitute any number of white fish varieties if you like. Some options are snapper, mahi-mahi, grouper, flounder, or halibut. Fish taco sauce does not have to be complicated. We simply combined sour cream and ranch for a zesty sauce. Now, if you like a little extra kick you could add a dash (or more) of chili garlic sauce like sriracha. Also, if you want to skip the ranch seasoning, you could also use this variation instead. 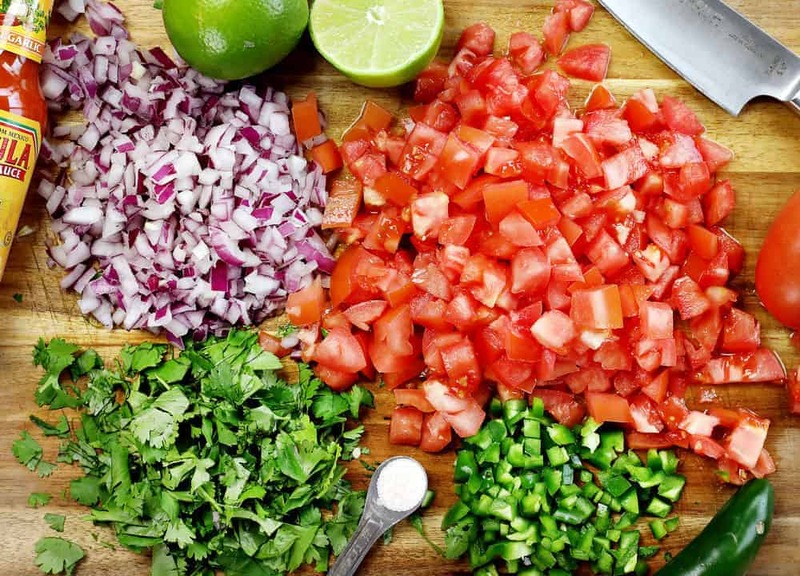 The best fish taco recipes call for hand chopped, fresh veggies in a fresh garden salsa, otherwise known as pico de gallo. If you have your own pico recipe that you swear by, by all means, swap it in! This is the one that we use and it was the perfect compliment to the other ingredients. You will need the following ingredients, all roughly chopped to your liking. We like the chunks a little bigger. Simply chop all of those ingredients up and stir them together. Season to taste (I tend to like it a little saltier) and pop it in the fridge. The flavors do start to marinade the longer it sits. I like to mix mine up the night before. As an added benefit to the flavor, it makes clean up and prep a little easier. 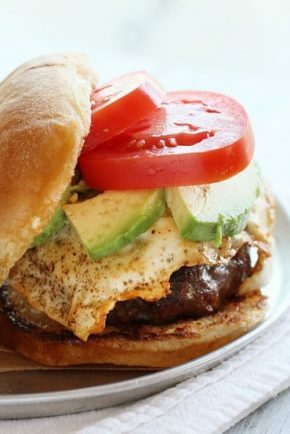 This is one of those recipes with lots of steps. To make the Baja fish tacos recipe, I like to start by prepping as much as possible before I fry the fish. You will want to serve the fish hot out of the pan so it is smart to have everything ready for action before the fish hits the oil. Start by cleaning and drying and cutting the fish, let it set out on a paper towel while you prepare the rest of the ingredients. Fresh Salsa – Chop up all of the veggies, and mix together your fresh salsa in a medium bowl. Feel free to add more or fewer jalapenos to adjust the level of spice. I also have seen folks add some cayenne pepper here, which would be nice if you like a little extra kick! Set the bowl in the fridge to marinate while you get the rest of the ingredients ready. Taco Slaw – Next, prepare the taco slaw. 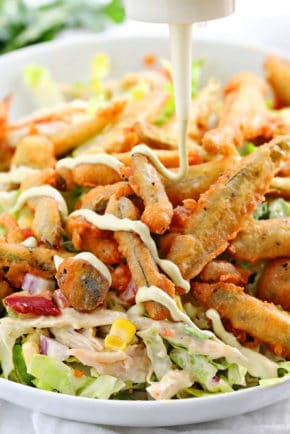 Grab another bowl and mix together the coleslaw and ranch, toss to coat. You can also add any other fresh greens that you want to this portion. We sometimes add chopped arugula, kale, or cilantro to the slaw mixture. Pop the bowl in the refrigerator next to your salsa and move on to make your fish sauce. Fish Taco Sauce – In a small bowl, mix together ranch and sour cream. We like to put ours in a squeeze bottle, but if you don’t have one handy, you can always put it in a plastic baggie and snip the end off, kind of like a piping bag! Toss that in the fridge as well. 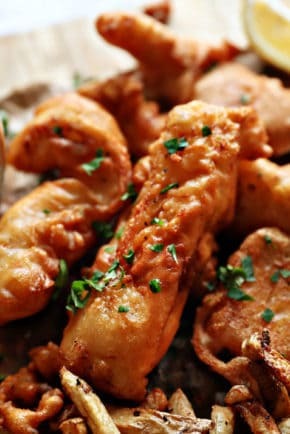 Beer Batter – Finally, mix the beer batter dry mixture and the beer together. The consistency should be a little runnier than pancake batter. If your batter is too thick your crust will be too soft and thick. You can always add a little water to adjust the thickness if necessary. 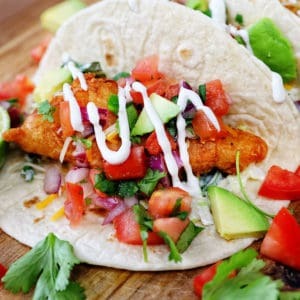 Fried Fish Tacos – Now you are ready to start frying the cod fillets. 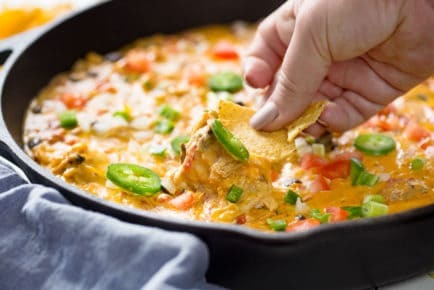 Heat the oil in a pan, and while the oil is getting hot, you can start putting your tortillas, salsa, slaw and white sauce out on the table. This next step will go fast so call the troops to the table. Dip the dried cod into the batter (make sure to coat all sides) and drop it into the hot oil. Cook each piece 4-5 minutes total, flipping when the crust is golden brown. Cook in batches, being careful not to overcrowd the pan. Pull each piece out of the hot oil and onto a dry paper towel. Serve immediately. In a medium bowl, mix together tomatoes, onion, cilantro, jalapeno peppers, avocado, garlic salt, and lime juice. 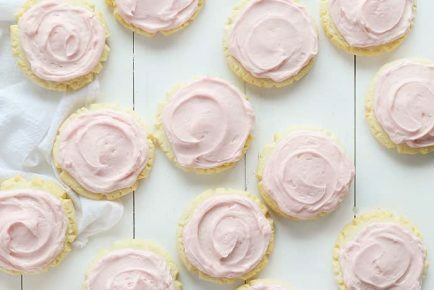 Refrigerate for 10-15 minutes (or longer). Toss coleslaw mix with ranch dressing in a bowl, set aside. In a small bowl combine sour cream and ranch dressing. Heat oil in a deep-fryer or large saucepan to 350 °F. Stir batter mix and beer together in a bowl. Dry cod pieces thoroughly before putting them into the batter. Dip cod in the batter mix; fry coated cod in batches in the hot oil until cod is cooked through and the coating is brown, 4 to 5 minutes. Do not overcrowd the pan. Remove cod with a slotted spoon and drain on a paper towel-lined plate. To serve, lay tortilla flat on a plate, top with taco slaw, 2-3 pieces of fried fish, a sprinkle of cheese, and fresh salsa. Drizzle with fish taco sauce, chile-garlic sauce, and lime juice if desired. This recipe is the total package and works together well and tasted like my favorite fish taco from that fresh seafood place on my honeymoon!